Nestled near to the Tortolita Mountains, close to Tucson, a magnificient environment, that rivals Scottsdale, can be found within Dove Mountain real estate. Homes in Dove Mountain offer spectacular views against a Sonoran Desert backdrop, abundant sunshine and the luxury of hiking, biking, horseback riding and golfing right in your backyard. Luxury Dove Mountain homes are part of The Residences at the The Ritz-Carlton®, where 27 holes of golf await the golfer at the Jack Nicklaus Signature Course. As one of the best courses in the area, having it just outside the door is one of the benefits of owning Dove Mountain real estate. Moreover, tennis players will enjoy illuminated courts that provide a setting for exciting matches with friends. Custom homes for the discriminating are the mark of luxury Dove Mountain real estate. Attention to detail and the utmost care in planning these Dove Mountain residences has made this community the preferred consideration for a magnificent lifestyle, where the blending of the outdoors mingles with the comfort of the indoors. 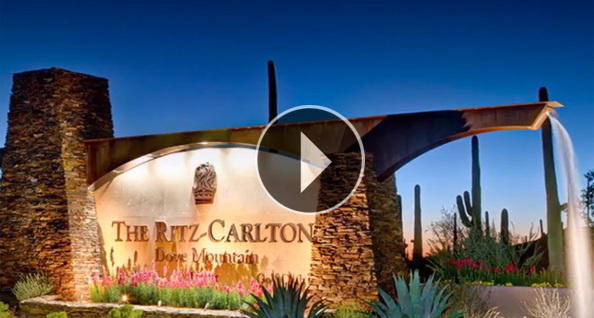 Eight floor plans comprise the starting point of these luxury Dove Mountain residences. Homes in Dove Mountain can easily be customized to specific designs that fit the requirements of one’s lifestyle and family needs. Estate homesites offer inspirational views of the surroundings and offer the setting for Dove Mountain residences that are worthy of being a dream home. Two neighborhoods provide the landscape for these outstanding luxury Dove Mountain homes. Living in Arizona and owning Dove Mountain real estate affords an active lifestyle. The nearby Ritz Carlton® offers spa services in a world class environment. Outstanding desert views and a relaxing pool and cafe are part of the ambiance provide by homes in Dove Mountain. The more athletic will enjoy walks or hikes on over 25 miles of improved trails for quiet meandering or exploration. Luxury Dove Mountain homes put the magnificent outdoors right within the grasp of those who pass by giant Saguaro cacti and abundant open space. Inca doves coo from the trees in an elegant tribute to nature. Dove Mountain real estate promises this and more at setting adjacent to mountains owned by Arizona State Trust; serenity and the outdoors are part of owning Dove Mountain residences. One can take guests camping right in the neighborhood; homes in Dove Mountain provide so much of an outdoor setting within the beauty of nature’s splendor. Owning Dove Mountain real estate for a second home is a wise investment. Relaxation and golfing, close to all the sparkling lights of Tucson, await amid the saguaros and privacy luxury Dove Mountain real estate provides. This is a fabulous time to consider Arizona real estate as an investment in lifestyle; the market has been improving and luxury Dove Mountain real estate offers an abundance of distinctive amenities as well as being an investment. Luxury Dove Mountain real estate is worthy of consideration for the lifestyle it affords, and luxury Dove Mountain homes provide access to the best of climate, leisure and nature’s beauty.